TC/American Monorail combines the resources and over a century of experience from: Twin City Monorail * American Monorail * Spanmaster to meet the needs of industry. Our products include: Underhung Cranes, Stacker Cranes, and Monorails. 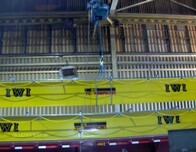 TC/American has the ability to manufacture a wide variety of overhead cranes. Our cranes use the same Patented Track technology that our monorail systems use ensuring serviceability and long life. TC/American can bend the Patented Track rail into a curved section allowing your system to travel unobstructed around corners and curves without any need to transfer loads. Switches allow the option of switching trolleys, tractors and hoists between two or three different lines on a monorail system. This eliminated the need to transfer loads from one hoist to another in the transport process. These light capacity cranes and monorails easily handle loads up to two tons. They offer the ultimate in flexibility, versatility, and economy. The 200 Series cranes and monorails deliver maximum strength and minimum roll resistance. They can be hand propelled, gravity or motor driven. The demands of industry for a broad line of hard working material handling equipment is the basis behind our 325 Series. It's complete, versatile, and expandable. It's the right move for transporting and positioning loads to 20 tons or greater. The 325 series rail systems are now also available on the Spanmaster® Work Center Cranes. The 400 Series is equally balanced between weight and strength. The 400 Series equipment can be configured to meet any complicated track layout. The 400 Series is compatible with most older 4" systems. Extra heavy loads, extra duty cycles and extra long spans require the 450 Series. Structurally engineered to assure practical overhead materials handling, the 450 Series is capable of moving loads up to 40 tons.